Posted by OromianEconomist in Amnesty International's Report: Because I Am Oromo, Ethiopia's Colonizing Structure and the Development Problems of People of Oromia, Afar, Ogaden, Sidama, Southern Ethiopia and the Omo Valley, Ethnic Cleansing, Genocidal Master plan of Ethiopia, Jen & Josh (Ijoollee Amboo), Nimoona Xilahuun Imaanaa, Oromo the Largest Nation of Africa. Human Rights violations and Genocide against the Oromo people in Ethiopia, The Tyranny of TPLF Ethiopia. 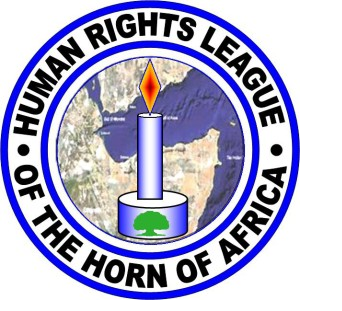 The Human Rights League of the Horn of Africa has been greatly saddened by the cold-blooded killing of 30 Christian Ethiopian refugees and asylum seekers in the past week in Libya by a group called Islamic State in Iraq and Syria/ ISIS. The HRLHA also highly concerned about thousands of Ethiopian refugees and asylum seekers living in different parts of Yemen were victimized due to the political crises in Yemen and hundreds have suffered in South Africa because of the unprecedented actions taken by a gang opposing refugees and asylum seekers in the country. The suppressive policy of the EPRDF/TPLF government has forced millions of Ethiopians to flee their country in the past twenty-four years. The mass influx of Ethiopian citizens into neighboring countries every year has been due to the EPRDF/TPLF policy of denying its citizens their socioeconomic and political rights. They have also fled out of fear of political persecution and detention. It has been repeatedly reported by human rights organizations, humanitarian and other non – governmental organizations that Ethiopia is producing a large number of refugees, estimated at over two hundred fifty thousand every year. The HRLHA calls upon the Ethiopian government to unconditionally release the detained citizens and allow those who have been injured during the clash with police to get medical treatment.In connection with the incident that took place in Libya, on April 22, 2015 tens of thousands of Ethiopians marched on government- organized rallies against the killing of Ethiopian Christians in Libya. However, with the demonstrators’ angry expressions were directed at the authorities, the police used tear gas against them and hundreds of people were beaten on the street and arrested. On the 23rd and 24th of April 2015 others were picked up from their homes and taken to unknown destinations according to the HRLHA reporter in Addis Ababa. The Ethiopian Government must provide the necessary lifesaving help to those Ethiopians stuck in crises in the asylum countries of Yemen, South Africa and others. The EPRDF/TPLF government must release journalists, opposition political party members, and others held in Ethiopian prisons and respect their right to exercise their basic and fundamental rights enshrined in the constitution of Ethiopia and international standard of human rights instruments. Posted by OromianEconomist in Africa, African Internet Censorship, Amnesty International's Report: Because I Am Oromo, Ethiopia & World Press Index 2014, Ethiopia the least competitive in the Global Competitiveness Index. In measuring national progress, Ethiopia as in its GDP per head records one of the lowest in Social Progress Index 2015. 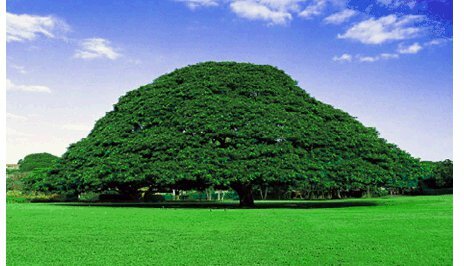 Ethiopia ranks 126 of 133 countries. Ethiopia (126), Niger (127), Yemen (128), Angola (130), Afghanstan (131), Chad (132) and Central African republic (133). One of the lowest in GDP (Income) and in SOCIAL PROGRESS Index. (Access to piped water, Rural access to improved water source, Access to improved sanitation facilities). (Political rights, Freedom of speech, Freedom of assembly/association, Freedom of movement, Private property rights). (Discrimination and violence against minorities, Religious tolerance,Community safety net). (Years of tertiary schooling, Women’s average years in school,Inequality in the attainment of education, Globally ranked universities). Ten countries in the world have been ranked as Very High Social Progress Countries as these countries generally have strong performance across all three dimensions. The average dimension scores for this tier are: Basic Human Needs is 94.77, Foundations of Wellbeing is 83.85, and Opportunity is 83.07. As with most high-income countries, the top 10 countries score lowest on Ecosystem Sustainability and Health and Wellness. Nearly all of the top 10 are relatively small countries, with only Canada having a population greater than 25 million. The top three countries in the world on Social Progress are Norway, Sweden, and Switzerland with closely grouped scores between 88.36 and 87.97. The third tier of Upper Middle Social Progress Countries comprises of 25 countries. This group reveals that high GDP per capita does not guarantee social progress. Average scores for this tier are: Basic Human Needs is 80.66, Foundations of Wellbeing is 73.52, and Opportunity is 57.73. Under the Low Social Progress Countries tier, there are 27 countries which include many Sub-Saharan African countries. The average dimension scores for this tier are: Basic Human Needs is 50.03, Foundations of Wellbeing is 58.01, and Opportunity is 38.35. 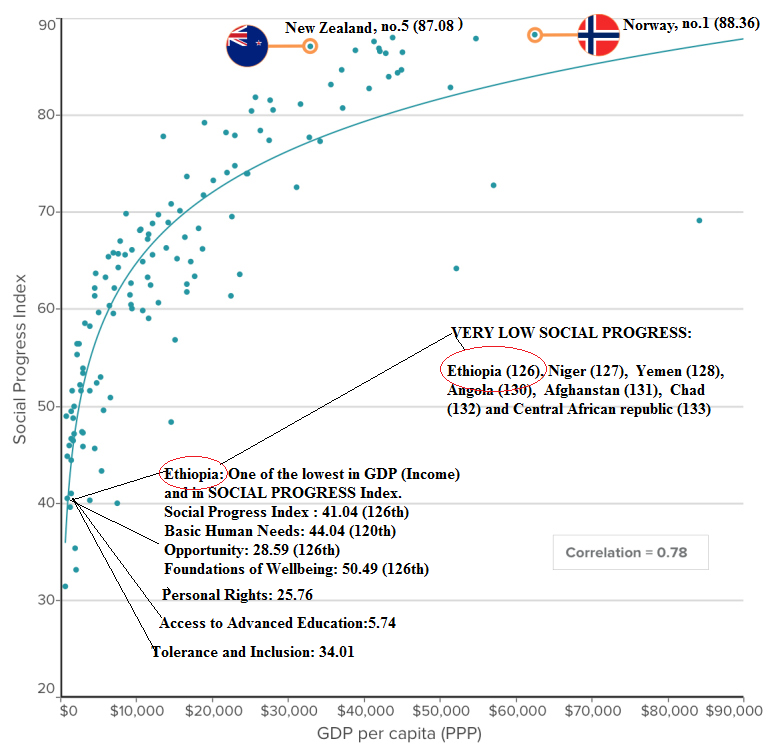 Under the Very Low Social Progress Countries tier, there are 8 countries. The average dimension scores for this tier are: Basic Human Needs is 38.46, Foundations of Wellbeing is 48.55, and Opportunity is 26.05. The lowest five countries in the world on Social Progress are Ethiopia, Niger, Afghanistan, Chad, Central African Republic. The Social Progress Index, first released in 2014 building on a beta version previewed in 2013, measures a comprehensive array of components of social and environmental performance and aggregates them into an overall framework. The Index was developed based on extensive discussions with stakeholders around the world about what has been missed when policymakers focus on GDP to the exclusion of social performance. Our work was influenced by the seminal contributions of Amartya Sen on social development, as well as by the recent call for action in the report “Mismeasuring Our Lives” by the Commission on the Measurement of Economic Performance and Social Progress. Exclusively social and environmental indicators: our aim is to measure social progress directly, rather than utilize economic proxies. By excluding economic indicators, we can, for the first time, rigorously and systematically analyze the relationship between economic development (measured for example by GDP per capita) and social development. Prior efforts to move “beyond GDP” have comingled social and economic indicators, making it difficult to disentangle cause and effect. Outcomes not inputs: our aim is to measure the outcomes that matter to the lives of real people, not the inputs. For example, we want to measure a country’s health and wellness achieved, not how much effort is expended nor how much the country spends on healthcare. Holistic and relevant to all countries: our aim is to create a holistic measure of social progress that encompasses the many aspects of health of societies. Most previous efforts have focused on the poorest countries, for understandable reasons. But knowing what constitutes a healthy society for any country, including higher-income countries, is indispensable in charting a course for less-prosperous societies to get there. Actionable: the Index aims to be a practical tool that will help leaders and practitioners in government, business and civil society to implement policies and programs that will drive faster social progress. To achieve that goal, we measure outcomes in a granular way that focuses on specific areas that can be implemented directly. The Index is structured around 12 components and 52 distinct indicators. The framework allows us to not only provide an aggregate country score and ranking, but also to allow granular analyses of specific areas of strength and weakness. Transparency of measurement using a comprehensive framework allows change-makers to identify and act upon the most pressing issues in their societies. These design principles are the foundation for our conceptual framework. We define social progress in a comprehensive and inclusive way. Social progress is the capacity of a society to meet the basic human needs of its citizens, establish the building blocks that allow citizens and communities to enhance and sustain the quality of their lives, and create the conditions for all individuals to reach their full potential. Does a country provide for its people’s most essential needs? Are the building blocks in place for individuals and communities to enhance and sustain wellbeing? Is there opportunity for all individuals to reach their full potential? These three questions define the three dimensions of Social Progress: Basic Human Needs, Foundations of Wellbeing, and Opportunity.